Without his uttering a sound. caused the loss of a tooth? At the end of each day. Each day they must flirt. This poem was inspired by a group of young African boys, aged between 15 and about 18 years old, who beg at the traffic light outside a major shopping centre I frequent. It is a tragedy to watch them, crouching on the ground and begging for a crust of bread, week after week. Gradually their spirits and health deteriorate from the hard life. a new dawn is painted on a canvas bold. warming the earth and evaporating mist. leopards copy owls and wild-dogs run loose. when Africa’s sun comes up. I am an early riser and, for me sunrise is a powerful inspirational tool and one of my most productive writing times. Dawn in the African bush is full of raw, evocative power and beauty. Kim Blades’ poetry is a written depiction of her life in Durban, South Africa. In 1966, at the age of three, Kim emigrated from England with her parents, material grandmother, older sister and nine-year old German Shepherd. She enjoyed a fantastic childhood on the Bluff, a relatively underdeveloped coastal suburb of Durban. Her house was only a ten-minute walk from pristine beaches as well as natural bush, where Kim spend a lot of time searching for snakes, chameleons and other wildlife; Gerald Durrell style. Kim spend long weekends camping in the mountains of the Drakensburg, which was much more rustic then than it is today. It was a favourite place for her family to visit during the winter months when snow covered the highest peaks. Kim wanted to become a game ranger after leaving school, but this was not open to women as a career until more than a decade after Kim matriculated from school in 1980, by which time Kim was teaching English and History at a high school. Kim got married at 32 years of age and had two sons, both of whom are working now. Kim’s wonderful childhood in a country [South Africa] that she loves and her two children, have been and always will be, her greatest inspiration. Robbie, short for Roberta, is an author with five published children’s picture books in the Sir Chocolate books series for children aged 2 to 9 years old (co-authored with her son, Michael Cheadle), one published middle grade book in the Silly Willy series, one published preteen/young adult fictionalised biography about her mother’s life as a young girl growing up in an English town in Suffolk during World War II called While the Bombs Fell (co-authored with her mother, Elsie Hancy Eaton) and one book of poetry, Open a new door, co-authored with Kim Blades. 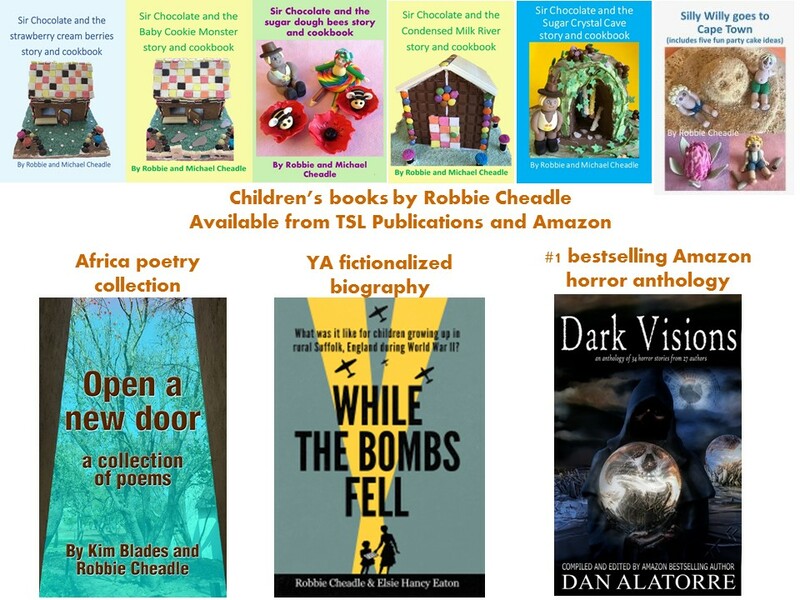 All of Robbie’s children’s book are written under Robbie Cheadle and are published by TSL Publications. Robbie has recently branched into adult horror and supernatural writing and, in order to clearly differential her children’s books from her adult writing, these will be published under Roberta Eaton Cheadle. Robbie has two short stories in the horror/supernatural genre included in Dark Visions, a collection of 34 short stories by 27 different authors and edited by award winning author, Dan Alatorre. These short stories are published under Robbie Cheadle. 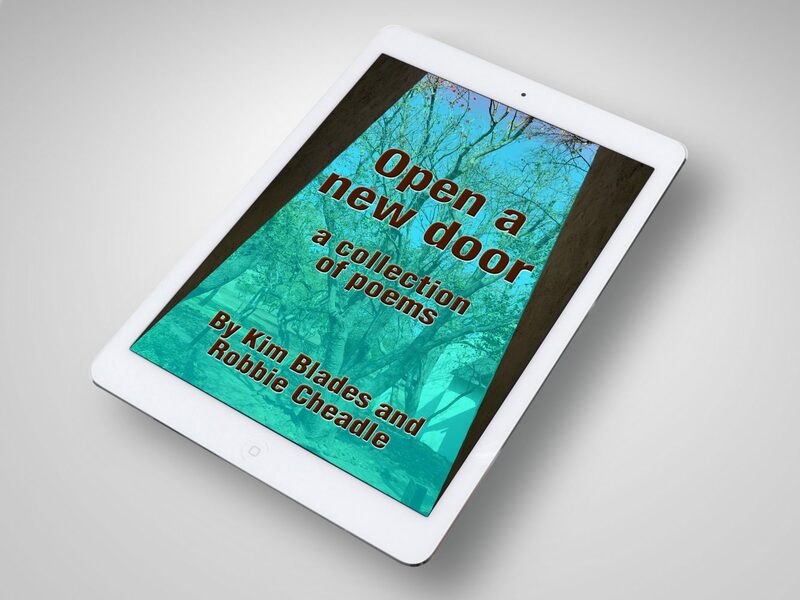 This entry was posted in books, creative writing, literature, newauthoronline, poems, poetry, uncategorised and tagged guest post, kim blades, newauthoronline, Open a new door a collection of poems, poetry, poets, Robbie Cheadle, south africa on November 6, 2018 by K Morris Poet.